Short answer: because they don’t know! It has to do with our faulty mental wiring. Humans are great at making incorrect snap judgements about causal relationships. We’re even better at this flavor of bad judgement when evaluating ourselves. When a person is swimming in a sea of habit patterns, how can we know which of these patterns is producing a particular result? This is why epidemiologists look at large populations and large data sets to uncover correlations. Yes, “correlation is not causation” but as the great Edward Tufte said so well, “correlation is not causation, but it sure is a hint.” And correlations across large populations over long periods of time provide better hints. Imperfect hints indeed, but better quality hints than those an individual draws from his personal behavior. Start with 1,435 good companies. Examine their performance over 40 years. 11 of those companies became great and they shared these 7 things in common. As book origin stories go, that’s one of the best ever. 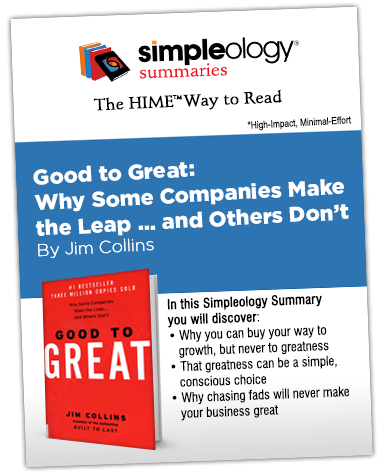 Collins and his team drew 7 key conclusions that have become an essential staple to business parlance. Do a quick check – do you know each of these Good to Great terms? 1. How did you do? Do you know each of them? Anything less than 100% is a failing score. They’re that essential. 2. And by “know” I mean – do you know them cold? ”Yeah. Yeah. I’ve heard that term before, I think it means …” is also a failing score.